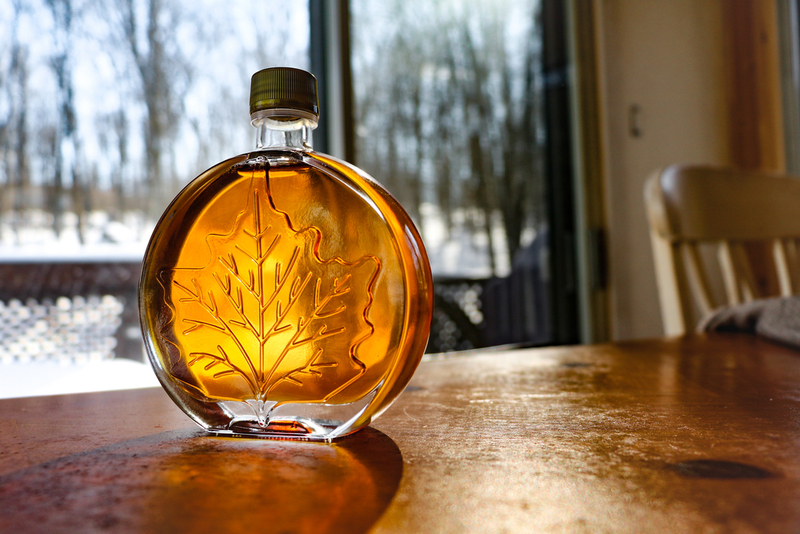 Maple syrup season came early this year, with warm days prompting sap to run as early as January in some parts of the country. As the climate warms, this scenario is predicted to play out more often. Indeed, in New York and New England, the sap run season starts about eight days earlier than it did 50 years ago. The unpredictable weather typical of early spring can also cut sugaring season short. And as it turns out, other side effects of climate change, such as more pests or drought, could stress sugar maples too much—and when that happens, they produce defensive chemicals in bitter, unpalatable quantities. Selena Ahmed, an assistant professor of sustainable food and bioenergy systems at Montana State University, has studied how climate change could affect a variety of foods whose nutrients and taste we prize, including maple syrup, tea, and spinach. While much research has focused on how the quantity of food we harvest may be affected in a warmer world, she explains how we could also see lower quality—and therefore less nutritious or flavorful foods. Read more about Ahmed’s research in diversified farming here. Selena Ahmed is an assistant professor of Sustainable Food and Bioenergy Systems at Montana State University in Bozeman, Montana. IRA FLATOW: Turning the page. The warm weather this winter means an early start for the maple syrup season. Producers started tapping trees as early as January this year. It got that warm this year. And now an early season. It is– you know, it’s not always good news. The sap only runs for about six weeks, and if the temperatures aren’t just right, it could end early or it could just stopped flowing. And some producers are also seeing less of the highly valued fancy syrup. You know that lightest colored variety that you pay for higher prices in the store. So what links can we draw between climate change and the future of our pancake toppings? Our next guests are working this stuff out. Selena Ahmed is an assistant professor of sustainable food and bioengineer systems at Montana State University in Bozeman. She’s been researching what we can predict for the availability and quality of foods like maple syrup, even tea, spinach, others in a warming world. Dr. Ahmed welcome to Science Friday. SELENA AHMED: Thank you for having me on, Ira. IRA FLATOW: So what is wrong with having early spring where the maple syrup is concerned? SELENA AHMED: Well there are several things, and one is just the increased uncertainty. Producers have particular labor schedules. And especially large producers that have a lot of trees to tap. There’s a lot more uncertainty with what’s happening with climate variability. And having earlier flows sort of makes things more unpredictable. Another thing is, as you know, maple sap and syrup needs very specific freeze-thaw cycles. And so it needs these above freezing temperatures in the daytime and below freezing temperatures at night time. And so having sap come early and having maple syrup come early is wonderful. But then when we actually start getting another freeze cycle where we’re not actually seeing those warming days, the sap actually stops flowing. And so that causes a lot of uncertainty for producers. IRA FLATOW: Are the trees actually stressed out by all this change? SELENA AHMED: Yes. The trees are also stressed out by the change. Maple trees need specific freeze-thaw cycles, but they also like a lot of snow pack. And the changes in the snow pack, the warming, is actually causing a little bit of root dieback for the trees. And that’s decreasing the health of the trees. And so sap essentially is water that’s coming up through the roots. And by having unhealthier roots, that’s really impacting the sap we’re getting. IRA FLATOW: This is Science Friday from PRI, Public Radio International. So what effect is that happening on the kind of maple syrup? The kind of sap, I guess, that you would be using to make the kind of maple syrup that we use. SELENA AHMED: Sure. So as you mentioned earlier, Ira, a lot of times earlier in– a couple of decades ago, producers would see a lot more of that high quality, light, fancy grade sap that you were talking about, or syrup. And that really had perhaps less phytochemicals or a secondary metabolites. And so secondary metabolites are those compounds that plants produce when there is stress. But we as humans a lot of times benefit from those compounds in terms of their flavor compounds, as well as the health benefits. And so when plants are stressed they’re producing a little bit more of these compounds. And what we’re seeing in our different sites where we’re collecting maple sap and maple syrup, is that in the areas that are warmer in the southern range, we’re actually seeing more sap with these secondary metabolites. And so indicating that the plants are a little bit more stressed in the southern range. And the flavor of maple syrup is very subjective. And so we’ve been doing some consumer research, and a lot of people prefer some of these darker syrups, and some people prefer some of the lighter syrups. But in terms of the health aspects, we know that the secondary metabolites are actually beneficial for health. However, too much of those compounds can actually produce an off flavor where consumers no longer have a preference for that type of syrup. And so we’re seeing a lot of variability in terms of what’s happening. And it’s just becoming a lot more uncertain. IRA FLATOW: I know that you also spend a lot of time studying tea and climate change. How is tea like maple syrup? SELENA AHMED: Sure. So tea is also similar to maple syrup in that it needs specific environmental conditions for an ideal harvest. And so in most places where a tea grows, it grows in three different seasons. And it has– very similar to maple– a winter dormancy. And the new buds come in the early spring season. And that also, like maple, is getting earlier every single year. And so producers actually are not excited about the early spring bud bursts because they think that the trees need a winter dormancy to actually produce a healthy flush. And also, in some places where it gets warm and then it gets cold, it actually, the frost causes leaf damage. And then producers actually lose their very healthy spring harvest. IRA FLATOW: So I guess if you want to adjust to the climate change, if you’re a farmer, you should then not plant a monoculture, but a variety of things. Because it’s unpredictable now what’s going to happen. SELENA AHMED: Absolutely, yeah. And we’re seeing that both in the maple syrup system as well as in the tea system. And so we’re actually seeing producers of maple syrup who have historically mostly commercialized sugar maple. They’re also starting to tap other trees such as red maple and birch. Very similarly in tea systems, I’ve been doing research looking at monoculture tea plantations in China. And then comparing that to the quality of these indigenous agro forests, where farmers are not only growing tea of one variety, but they may grow up to 15 different farm or land races within the same tea system. And then the system is further diversified in terms of its structure. Very much looking like a forest environment. So when I actually go into these tea gardens, it feels like it’s a diversified forest. SELENA AHMED: And farmers are actually relying on this diversified structure for ecosystem services, including managing for pest and disease and fertilizers. And so these are organic systems, diversified organic systems. And we’re seeing that these systems are actually more resilient to climate variability. Kind of going with the old age saying not to put all your eggs in one basket. IRA FLATOW: Right. Dr. Ahmed, could you come back and talk more about growing food and changing climate for us? Sustainable farming. IRA FLATOW: We’ve run out of time. IRA FLATOW: We’ll have you back Dr. Ahmed to talk about it. Selena Ahmed is assistant professor– we just pushed her up and up, sustainable food and environment energy systems at Montana State University in Bozeman. Just another reminder, Kim Stanley Robinson will be talking with us coming March– this Monday March 20th at The Strand. Get your tickets at sciencefriday.com/bookclub. We’ll see on Monday in New York if you can make it. Charles Bergquest is our director. Our senior producer Christopher Intagliata. Our producers are Alexa Lim, Christie Taylor, Katie Hiler. [? Kate ?] [? Richkim, ?] our technical director Sarah Fishman, Jack Horowitz, are engineers at the controls here at the studios of our production partners, the City University of New York. Speaking of which I’m Ira Flatow in New York.